Grindworks is created upon a foundation of creative people, quality materials and top notch manufacturing. The grindworks MB-1 FORGED is a small muscle back iron designed for players who appreciate beautiful lines and soft feel. Control, stability and accuracy are all strong points of this precision forged S20C iron. At Grindworks we believe, an iron isn’t only about beauty but all about functional beauty. We designed the MB-1 Forged with smooth curved lines in mind. These flowing curves are not only intended to provide a beautiful visual appearance but also allowed us to create a progressive flow of the center of gravity, increasing all around performance and usability. The curved and stepped design of the MB1-FORGED allows us to gradually move the center of gravity from lower to higher as the irons progress from long to short, a feature we have dubbed Dynamic Gravity Progression. Dynamic Gravity Progression makes the long irons more forgiving and easier to launch and hit for distance thanks to the lower CG placement. The mid irons see the CG gradually shift higher thanks to a calculated change in the size and position of muscle back’s curves. The mid irons produce an all around trajectory with balanced distance and accuracy. The short irons see the CG shifted away from the sole and higher in the head which create a more penetrating trajectory aimed right at the pin for optimal accuracy and control. 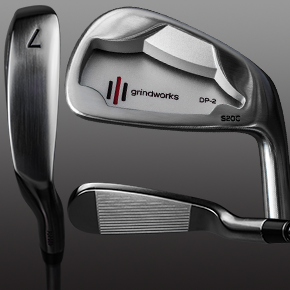 The grindworks CB-1 FORGED is a smallish cavity back iron designed for players who want a great feeling all around iron. This precision forged S20C one piece cavity will appeal to better players who want control and workability as well as better golfers who don’t mind a bit of forgiveness as well. Like the MB1-Forged, we wanted the CB1-Forged to feature softer lines and smoother curves. We believe these type of lines have a better visual effect on the golfer not only at address but also when looking at an iron in general. While we believe in the saying “simple is best” we still wanted to implement functional design that would still make the iron unique and help it perform optimally. We implemented a feature we call Horizontal CG Flow which sees the CG change progressively across the set in a horizontal direction. HCF sees a cutaway toe, and more weight towards the heel, allowing the 4, 5, and 6 irons to rotate square faster, helping golfers square to the ball more consistently for better impact and more distance. The 7 iron has neutral weighting while the 8, 9 and PW see progressively more heel relief allowing for more control and workability for attacking the pin. The Grindworks CB-1 FORGED is the forgiving all around cavity back with great feel.